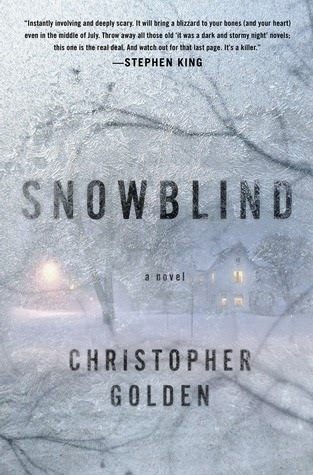 From Goodreads.com The small New England town of Coventry had weathered a thousand blizzards...but never one like this. Icy figures danced in the wind and gazed through children's windows with soul-chilling eyes. People wandered into the whiteout and were never seen again. Families were torn apart, and the town would never be the same. OH.MY.GOD. This book! This is one of the rare combinations of subtlety (where they don't need blood and guts or mangled body parts to tell the story) and immediate action (seriously.. it picks up during the "first killer" blizzard and just goes on from there). This book would appeal to those readers that like both "thriller" and "horror" novels. The characters are written in such a way that they are realistic and relate-able (even if you only get to know a few of them really well). You find yourself rooting for them, even while thinking they could very well be your neighbors. You worried with them, you cheered with them.. hell you even cried with them. This book had everything! Overall, I found myself shivering at some parts, desperately hoping for no snow in others (although I live in New Jersey where snow is common), and fervently wishing there will be another novel after this one (oh.. that ending! It left me clicking my kindle and cursing.. in a good way... when I realized there was no more to this one). This is one of those stories that has picked a perfect "Snow filled" release date of January 2014! DISCLAIMER: I received a complimentary copy of Snowblind in return for my honest review. This does not in any way reflect upon my review. All thoughts/opinions of this novel are 100% my own.